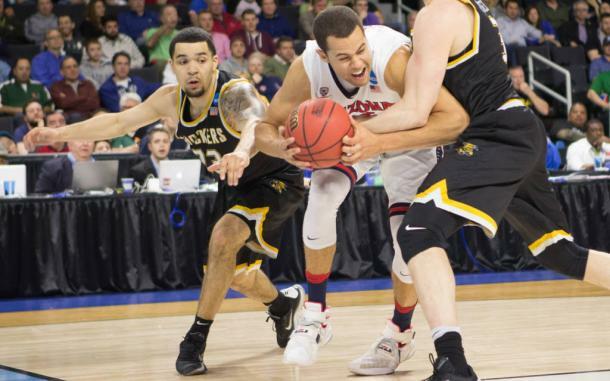 Wichita State defeats the Arizona Wildcats by 10 to move on to the second round of the tournament. The no. 11 Wichita Shockers caused their first upset in the NCAA Tournament as they beat the no. 6 Arizona Wildcats by a score of 65-55. Ron Baker lead all scorers on the night with 16 points going 5-13 from the field. This game though, was never really that close. Wichita busted out of the gates with an energy that Arizona never found. They hounded Arizona's ball handlers and forced 19 turnovers off of nine steals. Ka'Deem Allen, who is Arizona's first-choice point guard, turned the ball over seven times. The defensive effort was key to their victory as it created easy scoring chances down the other end of the court. The Shockers did not have the greatest nights shooting though. As a whole, they attempted 59 shots but made only 24 of them. That is good enough for nearly 41% from the field. If Wichita wants to make a deep run into the playoffs, their shooting percentage will have to increase closer to 50%. From behind the arc, though, they were abysmal. Of those 35 missed shots, 17 of them came from deep. This was their lone misstep on an otherwise stellar performance. Seniors Ron Baker and Fred VanVleet led the show once more. They combined for 29 of their schools 65 points with the former finishing on 16. Only two other Shockers finished in double-digits for point totals and they came off the bench. These two have been their school's catalysts all season long and were the heart and soul of the team tonight. The defensive effort started with these two and it always seemed they got at least one touch on the ball in the offensive end. Markis McDuffie and Conner Frankamp both scored 10 points. McDuffie also came away with four rebounds and two steals while Frankamp added two more steals and two blocks. However, more guys off the bench will have to step up if they want make another deep run in this tournament. Throughout the season, Arizona were a high-scoring team, but tonight they could not find their rhythm. Even when the Wildcats were able to get into good looks on the offensive side of the court, their touch was just a bit off. As a result of that, Sean Miller's men shot an abysmal 41% from the field. Combine their inability to shoot and inability to hold onto the ball was always going to give them fits. In his last game in an Arizona jersey, Kaleb Tarczewski did not have much of an impact. He got only three shot attempts and made two of them. From the free throw line he was a bit better, making 4-7 shots from the stripe.Tarczewski had a fantastic career and the Wildcats will certainly miss his presence next season. The Wichita State Shockers move on to the second round of the tournament and will play the no. 3 see Miami (FL) on Saturday.